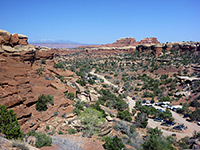 The longest maintained trail in the Needles district of Canyonlands National Park crosses several of the straight, flat-floored valleys known as the Grabens, then follows the exposed, treeless gorge of Lower Red Lake Canyon, descending over 1,000 feet to the sandy shores of the Colorado River, opposite Spanish Bottom, a point just over 3 miles downstream from the confluence with the Green River. The first 3.5 miles of the route is along the Elephant Hill Jeep Road, hence the hike could be shortened for those with suitable vehicles, otherwise the full distance, round-trip, is 19 miles and so just possible as a day hike during cooler times of year, though most people camp for one night beside the river. 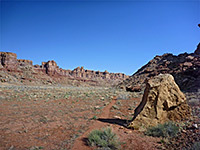 The scenery is varied along the way - Elephant Hill has views eastwards to the distant La Sal Mountains, the jagged pinnacles of the Needles and Chesler Park are visible from several places near the start of the trail, while the middle portion crosses the parallel ridges and ravines of the Grabens. 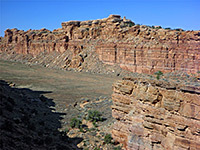 The last section, down Lower Red Lake Canyon, encounters a landscape unlike the rest of the Needles - the surroundings more closely resemble a Grand Canyon tributary since the drainage becomes deep, and wide towards the top, its sides formed of successive cliffs and benches of different sedimentary layers, colored various shades of red, brown and yellow. The Colorado River at the end of the canyon is relatively wide, lined by sandbanks, quite overgrown, and flows round a 90° bend, so there is no extended vista up or downstream, but the views are better if walking a little way north or south. Topographic map of the Red Lake Canyon Trail. 37 views along the trail to Red Lake Canyon; gallery, slideshow. The 3 mile Elephant Hill Access Road from Squaw Flat Campground is narrow and unpaved, traversing bushy land with several dry wash crossings and one blind curve, but is usually fine for all cars and small to medium RVs. The trailhead at road's end is the closest to Chesler Park, and the majority of visitors walk south to this location; Elephant Hill is a secondary attraction, while very few hike to Red Lake Canyon. The start of the jeep road has a notice warning about the difficulties of the route, and the cost of recovering vehicles if stuck ($1000 or more), but the hill is of course no problem for people on foot. The Elephant Hill trail climbs 150 feet over a mix of uneven slickrock, loose stones, and some aged sections of asphalt, to the plateau on top, which gives good views back across the parking area and the approach road, to the La Sal Mountains on the horizon. The land ahead is mostly flat and sandy, but the road soon descends at the far side of the plateau, via a few more tricky places (for vehicles); one spot requires driving backwards a way, as the curve is too tight to allow turning. The track drops down into a shallow valley which joins the larger Elephant Canyon; this is followed north a short distance to a junction, at the start of the one-way loop section of the jeep road. The surrounding locks are typical of much of the route – brownish, multilayered Cedar Mesa sandstone with some light-colored components, often sheer-sided, between 100 and 200 feet high and topped by rows of jagged pinnacles. Turning left, the road crests a narrow rocky ridge and descends into an unnamed tributary of Elephant Canyon, somewhat narrow at first but wider after a while. The floor is sandy, and the track follows a streambed then climbs a little way up the west side, over a small pass, across a sandy, bushy flat, and through a short narrow passage between two vertical rocks; many paint scrapes on the walls tell of vehicles only just making it through. 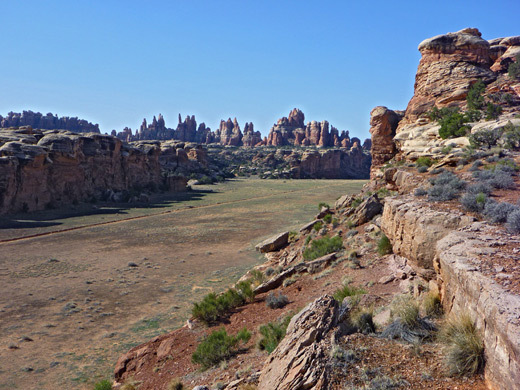 The taller pinnacles of the main Needles formation are now visible ahead, one mile south at the edge of Chesler Park. 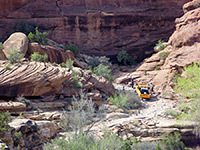 The drainage opens out somewhat in the middle of Devils Pocket, a straight, shallow valley, where the road reaches a T-junction; the left fork leads past the Devils Kitchen primitive campsite and to two routes towards Chester Park, while the right fork is the continuation to Red Lake Canyon. This follows a streambed a short distance, moves slightly above on the south side, crossing gently undulating ground, before a short descent to another junction in Devils Lane, a typical example of the Grabens, with a flat, grassy, sandy floor and long straight ridges of reddish rocks at either side. 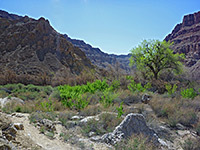 4WD roads split off north and south along the valley, while the Red Lake Canyon Trail continues west, heading towards a group of trees against the far wall, a spot that often serves as a collection point for windblown tumbleweed. The path traverses south a way, along a low bench at the rim of Devils Lane, then turns back west, down a small wash into a minor, unnamed valley. A sandy wash on the far side is followed for a few minutes before the track veers away to avoid several dry falls, and switchbacks down into the next big Graben valley (Cyclone Canyon), where a connection trail runs north towards the Confluence Overlook. On the far side of Cyclone Canyon, the path enters another shallow wash which descends quickly, down a boulder strewn slope, round some bends and out into the next Graben valley (and the widest), formed by upper Red Lake Canyon, and containing a big, sandy dry wash winding through the middle. 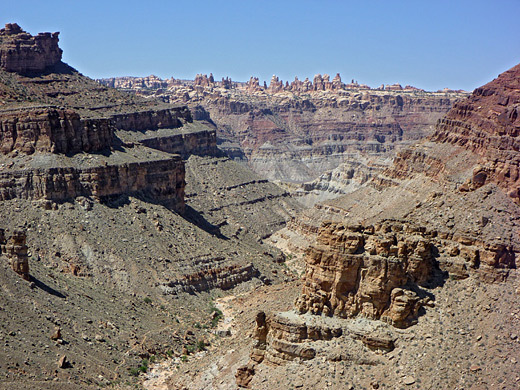 The trail runs along the east side, crosses over to the west and has a unexpected short but steep climb to a pass, overlooking the deepening lower section of the canyon straight ahead; this route is slightly shorter than following the drainage at floor level. A descent of another bouldery slope reaches a bench, which is followed westwards, initially close to the streambed, but the drainage falls away over a few high pour-offs, and the path is soon several hundred feet above. 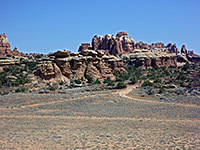 It rounds a corner, and the lowest section of canyon comes into view, beyond which, on the far side of the Colorado, are spires and pinnacles in the Maze district, a group known as the Sentinels. The river itself is not visible until right at the end. The path begins the steepest part of its descent, dropping 500 feet, right down to the sandy/rocky creek bed, now just 1.5 miles from the Colorado. The last stretch of the ravine narrows a little at stream level and curves round a U-bend, edged by orange brown rocks of the Paradox Salt Formation, which is found underneath the various sandstone and limestone layers exposed elsewhere in the Needles district. 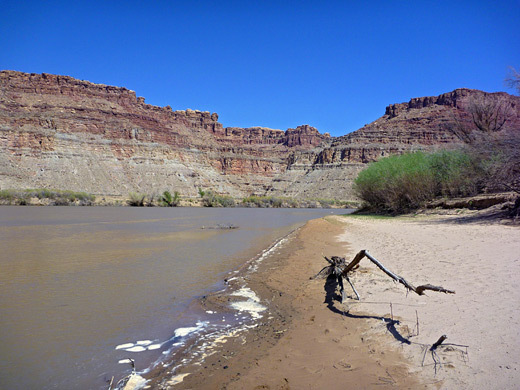 The official trail ends at an overgrown area next to the Colorado, though a lesser path continues northwards along the riverbank, above the riverside vegetation (mostly tamarisks), all the way to the Green River confluence just over 3 miles north. Lower Red Lake Canyon opens out to a sandbar opposite Spanish Bottom, a perfectly flat basin on the far side of the Colorado, reachable by a trail from the Dollhouse area of the Maze. The surrounding, layered cliffs are 700 feet tall, fairly uniform in height, and this location marks the upper end of Cataract Canyon, a rapid-filled stretch of the river that extends downstream towards Lake Powell.